Are Camcorders Down for the Count? Additional features include built-in 2.4/5 GHz for multiple streaming and FTP options. The PXW-Z90V provides external microphone support via two 3-pin XLR audio inputs (line, mic, mic +48V phantom) and a 3.5mm mini input. You can also use the PXW-Z90V's built-in microphone to record audio when shooting. For multicamera productions, the PXW-Z90V integrates seamlessly with Sony's MCX-500 live switcher (available separately). 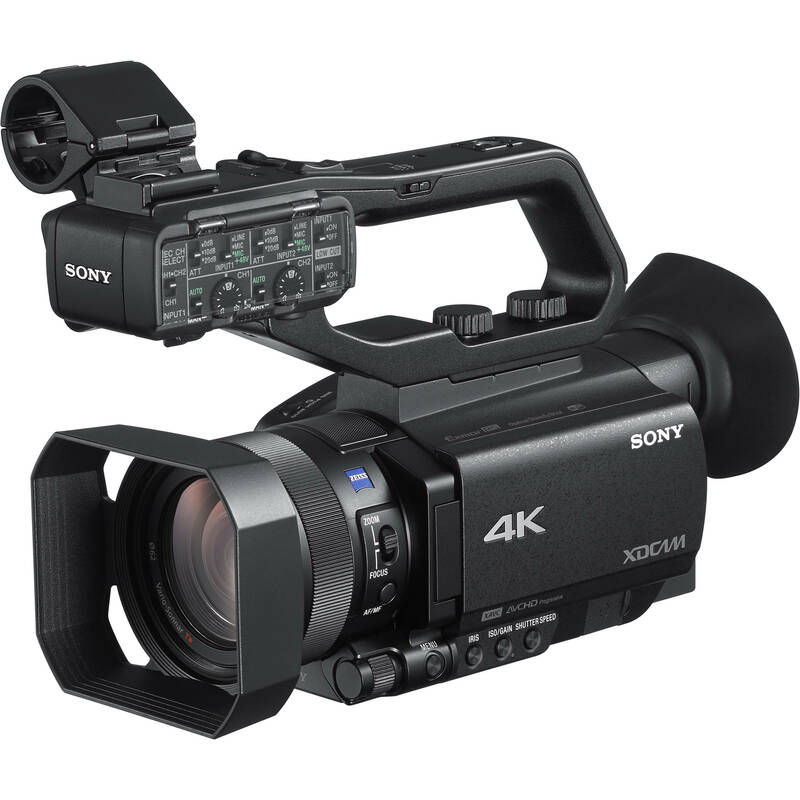 Box Dimensions (LxWxH) 10.25 x 9.7 x 6.0"
PXW-Z90V 4K HDR XDCAM with Fast Hybrid AF is rated 4.1 out of 5 by 17. Rated 5 out of 5 by Andrew from Superb light-weight camera I have two Sony FS-700R cameras that I usually use in conjunction with Odyssey 7Q+ monitors - but I was looking for a camera that was lighter and more portable, suitable for traveling as well as for using in tight locations. I'm very impressed with this camera. ?The image quality is superb, the auto focus is very fast and accurate. ?The controls, especially gain, aperture and shutter speed are really easy to adjust. ?I like that the handle can be removed to give a very small unobtrusive camera, or left on with its two XLR inputs and additional zoom and record controls. Just the camera I was looking for! ?Well done Sony. ?Thank you B&H. Rated 5 out of 5 by john from excellent work camera I'm upgrading to the z90 from 2 x70s which I loved.? This seems to be the exact same body which is great. ? The lcd screen shows more dynamic range.? These cameras amaze me with some nice bokeh and crystal clear images and great audio.? Extremely reliable and rugged.? I love the small size,? It will go easily from gimbal to slider to crane to rails with ease.? I cant say enough about how good these cameras are, I will soon get a second one for multi cam shoots. Rated 5 out of 5 by Alex from Fulfills my needs This nice little camcorder does exactly what I want: shooting 10 bits 4:2:2 in HD with very reliable and fast autofocus. With a good exposure, the image is quite good. ?Nice to have 4k.? Before I bought this camcorder, I did a thorough search on what this camera has and hasn't. I wish more buyers would inform themselves before writing a useless review about what they miss which they could've known before buying. In fact the last review is what triggered me to write my review, as to compensate for that. Rated 4 out of 5 by Gary B. from Workhorse, with excellent autofocus I got this camera for a long term project that requires flying to remote locations for interviews/lifestyle shots. I'm very glad I did. The image quality, autofocus, and build construction are all excellent. I don't have a problem with the limited number of assignable buttons, once I have the camera configured as I like, it is simple and easy to operate - and get image quality that to my eyes is often stunning. The reasons I didn't give 5 stars: 1) The fixed lens has a wide frame of about 30mm - which by today's standards is not wide at all. I purchased the Zunow WA adapter, which gets the wide out to a more reasonable 24mm.? 2) ?Either I can't find it, or it's not included - a horizontal level indicator in the viewfinder/lcd monitor. Someone tell me if it is there - if not I'm hoping it's added in a firmware revision. Bottom line - exactly what I wanted: rock solid, excellent image quality, compact while still being usable - and it delivers an image that both I and the client are very happy with. Rated 5 out of 5 by Tom from Great So far I ended up getting this camera from another vendor but do prefer BH.? Anyway, I have few uses for this camera. Right now I will be mainly using it on the end of a JIB cam that we use for our churches? Live Stream. In my opinion, this is one of the best options out there for jib use unless you have the budget to have a more expensive?camera and Jib. If it continues to work as well as it is I can see us buying a couple more for other camera positions like handheld roaming shots. Rated 4 out of 5 by Darrell from Here's the manual. Before I purchased, I searched everywhere online for the manual but could not find it.? As if it's 2005 all over again, they provided it on a disc with the camera.? Here it is: https://www.dropbox.com/s/5cftry4ovcd0w6m/Sony%20PXW-Z90%20Manual.pdf?dl=0 I've only had it for a few hours, so it's too new for me to review properly, but a few annoyances I found is that it does not have enough assignable buttons.? You need to menu dive for simple things such as zebra, peaking and setting white balance. Rated 4 out of 5 by Paul from Nice little handycam This is the 5th in my line of Sony handycams. I use these for a show on my boat and they are pretty rugged and nice picture quality for their size and format. The Z90 packs a punch in features, but you have to be careful with exposure. The exposure range is very narrow and under/over exposure can be a problem in my on the water shooting. Also sharpness is not the best unless it is bright light and the camera is locked down. Those two reasons are why it gets four stars. For the price I expected a little better, but it still does the job.